The BF-130-B has a 4.5mm thick blade of 440A stainless steel. 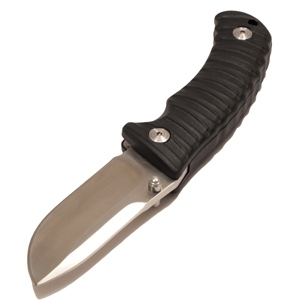 At 3.5 inches, the drop point blade provides a decent size for harder work than a small pocket knife. Dual thumb studs make ambidextrous opening a piece of cake. The blade is liner locked in the open position, with just enough resistance in the closed position to stop accidental opening. 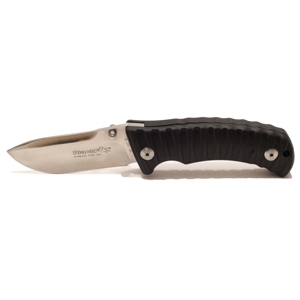 The liner sits just clear of the forefinger so even worked hard, the blade should remain securely engaged. The handle materials are a mix of nylon, glass fibre and rubber with steel liners, providing a comfortable, secure grip when in use. The Black Fox BF-130-B is for sale to over 18s only.